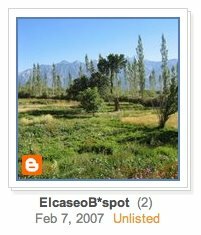 Each of your blogs now has its own album in Picasa Web Albums, which is exciting because you now have a photo management interface for your blog's photos - for example you could order prints, use the fancy email this photo feature, or easily embed the album somewhere else on the web. Be careful when you delete photos though, because deletions will affect both your blog and its album. Lastly, Blogger photos are now part of Picasa Web Albums' 1GB of free quota, which can be upgraded. Check out Picasa and Picasa Web Albums!